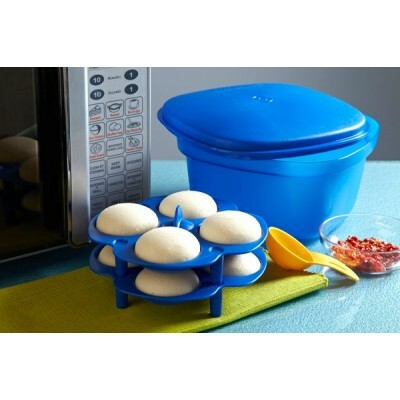 Tupperware Idli Tray come with perfect pore-holes which are ideal for steaming and do not allow the batter to drip and evenly steams the idli batter. The idli trays also come with a convenient top handle which allows you to easily lift up th idli trays once Idli is cooked. The size of the idli grooves are also perfect for making anytime snack-meal idli. It also comes with stands which easily fits into the stand grooves on the idli trays adn are sturdy so that the trays do not slip. Microwavr friendly and goes in easily with the Tupperware multicook.